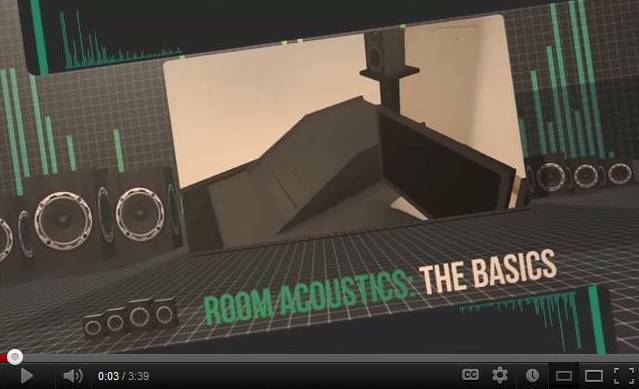 This video explores the basics of room acoustics. Most of us are in smaller, residential listening spaces which are on average 12ft X 15ft X 8ft in size. We usually have problems with the lower end or bass frequencies in these types of rooms due to bass frequencies being longer and more powerful than treble frequencies. Acoustic treatments like bass traps can correct issues with the lower end, as well as somewhat the mid or higher end without making it sound too dead if it’s broadband bass trapping. You may also want to add some diffusion into your room setup, usually on the back wall or near the tracking area. Diffusion will help with comb filtering, and flutter and slap echo, and it can also help with making your recordings sound more spacious. Most of us use existing rooms such as bedrooms, living rooms or basements for a listening space versus high end recording studios that are designed with acoustics in mind. However there are ways to treat average-sized rooms to be utilized as control rooms, home theaters or two-channel listening rooms. Trying to get a great sound in this type of space can be difficult. But thanks to a little math, or calculating your room size, and a little bit of acoustic treatment, we can make our rooms sound much better. In a typical 12 X 15 X 8 foot room, we’ll encounter acoustic problems starting with the lower end. The reason the bass response is usually more uneven than the higher end, especially in smaller rooms, is due to bass frequencies need more time to dissipate. And because of that, there’s more of a chance of an inaccurate low end response. You will encounter problems with mid- and upper-frequencies; but generally in a small room, low end frequencies are the bigger challenge. Fortunately, treating your room with properly designed broadband bass traps will absorb more low-end frequencies without over-absorbing the mid- and upper-frequencies. Tuned bass traps can also be utilized to absorb only low frequencies while reflecting mid- and upper-frequencies to keep more ‘life’ within the room. Some time down the road you will probably want to add some diffusion to your room setup. The difference between trapping and diffusion is that trapping absorbs, and diffusors scatter. Both types of treatment can correct the same problem, just via different methods. Put simply, trapping will prevent sound waves from traveling around too much which could have caused peaks and nulls in the frequency response. Diffusion also helps with this, but the way it works is that for example, when a powerful sound wave hits a diffusor, it scatters the wave which makes it less intense. Those are the basics of the problems your room is subject to. As mentioned, the smaller your room is, or the less your room was built with acoustics in mind, the more problems you could potentially encounter. We can begin correcting these problems with treatment, so let’s take a look at a very simple room setup to get you started. You can start by treating your corners with GIK Tri-Traps for example. We recommend starting with corners first as this is usually the place where you’ll get the most bang for your buck as far as frequency response and decay time. Get the front corners… and the back corners. Once that’s out of the way, we recommend treating what we call your ‘first reflections’ with GIK 242 Acoustic Panels. Treat your left, and right reflection points, then add some to the front wall. Due to the reflection of low end frequencies which create nulls and peaks at the listening position, we recommend GIK Monster Bass Traps on the back wall. And finally, we suggest installing 242 Acoustic Panels above your head to form a ‘cloud’. Let’s take it one step further. As an example, let’s add some diffusors along the side walls in the back which could be your ‘designated tracking area’. Let’s also add some grid fusors on the back wall. The diffusion back there will help with comb filtering, making it sound more spacious, and minimizing slap and flutter echo. This is a typical setup you’ll find in many project studios and it’s a good starting point for setting up your room. This entry was posted in Educational Videos, Videos and tagged acoustic panels, bass traps, diffusors, home theater, listening room, recording studio, room acoustics, room setup.